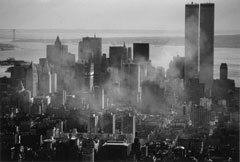 The latest installment in the exhibition series In Honor of Dirk Reinartz opens on 15 September, which would have been the photographer’s 60th birthday, and presents for the first time his photo series New York 1974. Coinciding with the exhibition, Steidl Verlag will publish the book Reinartz began of his New York pictures, which was completed after his death by Karin Reinartz. Ulf Erdmann Ziegler from Frankfurt has been invited to speak at the opening, which will run from 5 to 7 o’clock in the evening. The vintage prints shown in the exhibition halls at Galerie m, made from photographs the artist took on two private trips to New York in 1974, can now be enjoyed as a full series. Back then, the 27-year-old was the youngest photo reporter working for Stern magazine. Dirk Reinartz’ keen feel for the rhythm and architecture of Manhattan, his humorous and yet incisive focus on the people of the city, his understanding for both the comic and tragic aspects of city life, create a multifaceted, fascinating view of New York in the early 1970s. Characteristic of his work are the numerous figures peopling these images. On his first trip to New York, Reinartz seems to be fascinated on the one hand by the anonymous masses of people thronging the city streets and on the other by the paradox of what was for a young German a high degree of individualism.